A nice breakfast or lunch idea , maybe if you have food leftover. 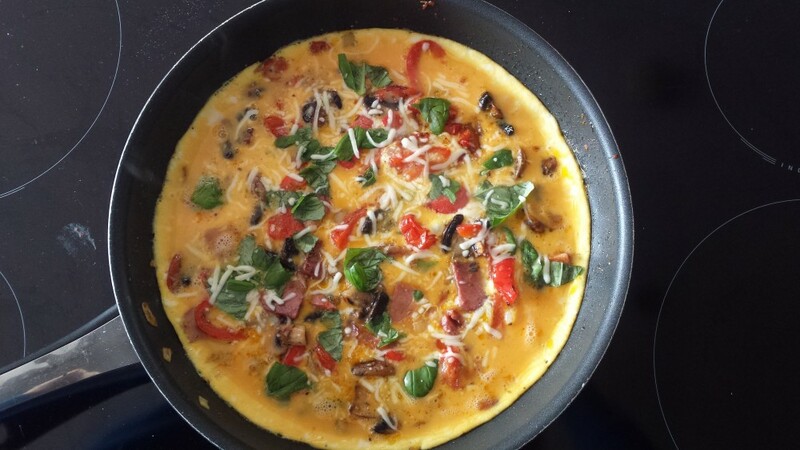 A Frittata (Italian omelette). This served 4. Eggs (5-6), half Onion, 2-3 cloves of garlic, 1 red eye chilli (optional), half red pepper, 8-10 cherry tomatoes, handfull of ham (chunks), 5-6 mushrooms, mozzeralla, fresh basil, mixed herbs, seasoning. Chop the veg and ham into small pieces and fry in olive oil until soft. Season and add the beaten eggs. Tear apart the basil and scatter. Sprinkle some grated mozzeralla and mixed herbs. When the base has set, put the pan under a grill to finish it off.